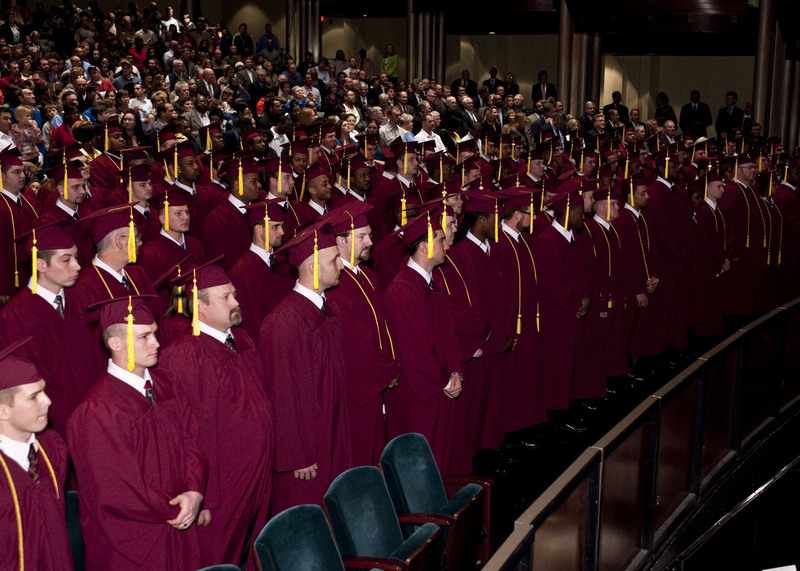 NEWPORT NEWS, Va., March 1, 2010 -- Northrop Grumman Corporation (NYSE:NOC) hosted commencement exercises on Feb. 27 for the company's Apprentice School located in Newport News, Va. The graduation was held at Christopher Newport University's Ferguson Center for the Arts for over 150 apprentices, representing 15 trades and five advanced programs. Dr. Glenn DuBois, Chancellor of Virginia's Community Colleges, was the keynote speaker. "Keep going. Every step, you will create greater opportunities for yourself, including becoming an even bigger leader for this shipyard," said DuBois. "As you continue your work on the waterfront, I wish you a long and safe and successful career." "Even though we may not be in uniform, we do provide a patriotic service to our country," said Michael Hopkinson, electrician, who received the Homer L. Ferguson Award for earning the highest average in combined required academic and craft grades. "We build some of the most sophisticated warships for our Navy to help defend our nation. As we leave here tonight, be mindful that everything we do, whether it's out on the job, in the classroom or outside of work, we represent the Apprentice School." "Apprentice graduates truly are the backbone of our shipyards," said Mike Petters, president, Northrop Grumman Shipbuilding. "You should walk taller and stand straighter with all that you've achieved. You've entered into a profession which requires much of you: strength of character, a desire to be part of something bigger than yourselves, fortitude under sometimes difficult and always demanding circumstances." The Apprentice School at Northrop Grumman Shipbuilding-Newport News provides high quality, comprehensive four and five year programs for students interested in shipbuilding careers. Since 1919, the programs have produced over 9,000 graduates in support of the operational needs of the company. An apprenticeship is a formal training program that allows students to receive instruction and experience - both theoretical and practical, in the various aspects of a skilled trade.